The BrandTech Titrette Bottletop Burette is the only bottle top burette that meets Class A accuracy specifications for glass burettes.This means that, if needed, the BrandTech Titrette Bottletop Burette can offer the precision of 3 decimal places below 20 mL. It can be quickly and easily disassembled in a matter of minutes - for cleaning, replacing the piston or cylinder, or replacing the batteries. The BrandTech Titrette Bottletop Burette is available in volumes from 10 mL to 50 mL, and with an optional RS232 communications interface. The BrandTech Titrette Bottletop Burette offers smooth operation along with its Class A precision, making routine titrations easier, quicker, and more accurate than ever before. The BrandTech Titrette Bottletop Burette is perfect for liquids that tend to crystallize, handling them with ease, and you no longer have switch between filling and titration. The BrandTech Titrette Bottletop Burette automatically detects whether you're filling or titrating by the rotational direction of the hand wheel and switch mode accordingly. Perfect for Multiple Applications. Ideally suited to water treatment, general chemistry, industrial titration, environmental work and food & beverage analysis. Class A Precision. The BrandTech Tirette Bottletop Burette meets Class A accuracy for glass burettes and provides precision of 3 decimal places below 20 mL. Protects Light-Sensitive Media. The clear cylinder inspection windows can be replaced with clip-on amber colored windows to protect your samples from UV light. Compact Design. You may move all the component to reduce headroom requirements above the unit location - including the titrating tube, which can be moved vertically and horizontally to suit your needs. PC Interface. Optional RS232 interface that will directly transfer all of your information to your PC if required. Easy Maintenance. It can be disassembled for cleaning to prolong the life of the BrandTech Titrette Bottletop Burette. 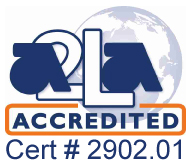 It is also is equipped with Easy Calibration™ technology that simplifies ISO/GLP compliance. High Compatibility. The 45mm standard thread, plus included adapters, fit most common lab bottles. Economical. Integrated SafetyPrime valve reduces waste of valuable reagents. Valves replaceable for simple, economical servicing of the unit. Easy Control. Large handwheels provide smooth, precise control. 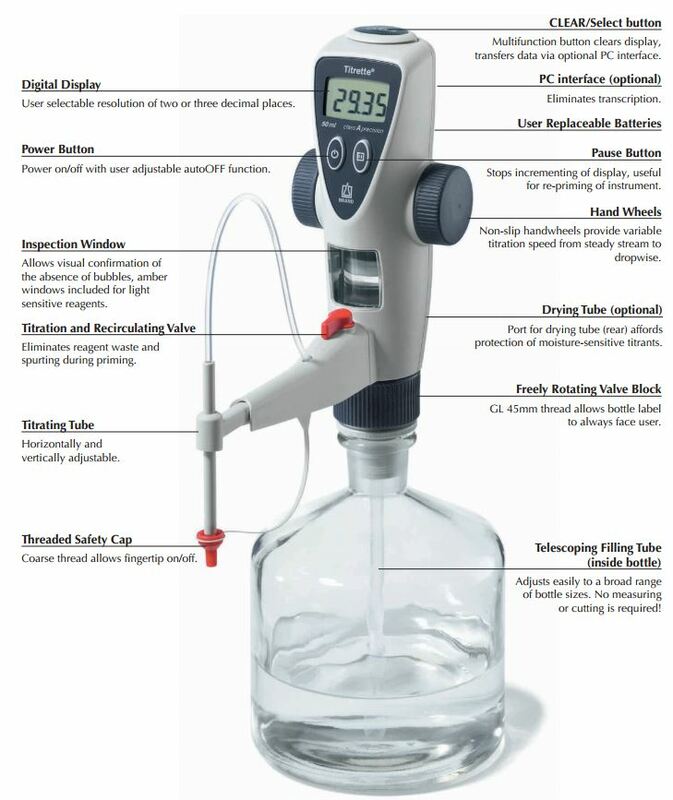 Simplify your titration work, order a Titrette Bottletop Burette!